I don’t know about you, but I’m someone who finds it incredibly difficult to obtain fashion items that are also comfortable and practical. The amount of times that I’ve been caught in the rain wearing flats and stockings and ended up at the office looking like a complete mess is just now too many to count. That’s why I was incredibly intrigued to hear about a line of fashionable gumboots that both looked beautiful and were functional: Lazy Raine‘s Art for Gumboots. These shoes put the glam into the practical, and the combination is made even sweeter by the fact that the boots were designed by Australian artist Claire Perrin. Claire wants to bring a new lease of life to the Aussie gumboot, and so decided to add a personal touch. The boots showcase a finger painting that she did at age 16, and so have a unique and personal style. I was lucky enough to be gifted a pair of the boots, and have used them on every rainy day so far! They’re comfortable and I’ve already received a lot of comments. If you’d like to grab yourself a pair, or find out more about Lazy Raine, head to her website, or find her on Instagram @lazyraine, and Facebook @LAZY RAINE. I caught up with Claire and found out about what inspired her to turn her art into a walking masterpiece for all to enjoy. How did your journey with Lazy Raine begin? I started out as a solo singer songwriter and Lazy Raine was my stage name, after 10 years of playing in bars around Melbourne and Europe I decided I wanted to offer more of my creative talents so I trademarked Lazy Raine to bring out a range of products and artwork. Were you inspired by an artist or fashion designer/label to start making the gumboots? I’m definitely inspired as an artist and I thought with the name Lazy Raine, gumboots was the perfect product to start with. How long have you been an artist? What medium do you normally work in? It sounds cliched to say but I was born an artist. I’ve always painted, wrote and played music. I mainly paint in oils on canvas using the technique of finger painting. I feel a real sense of freedom and joy in doing so. What are your hopes for the future of the Lazy Raine line? 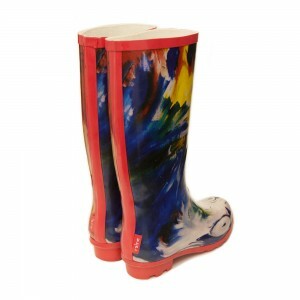 I would love to have a range of gumboots with my artwork on them as well as children’s sizes. I’d also like to do umbrellas and maybe rain coats. Prints and original artworks are available online. What were/are the biggest challenges in making your artwork come to life in a gumboot line? The hardest part in the initial stages was finding a supplier that would take my idea on board it took me 6 months to find one and I was talking to suppliers that deal with some of the biggest brands in gumboot production, they all said no, it’s too hard, pick an easier design, but I was determined to make it work. One of the suppliers who said no came back and said they will try to make it work, it took us another 6 months to figure out how to do it with myself, a multi media specialist and the supplier but the result was totally worth it. Do you have any advice for anyone out there wanting to start their own creative project? Do your research, trust your gut instinct and never give up! This entry was posted in Arts, Fashion and tagged art, fashion, interview. Bookmark the permalink.